This drizzly Monday morning saw the launch of a new CBC radio station in downtown Kitchener. Those of us who regularly listen to Toronto’s Metro Morning show were awoken to the sounds of Craig Norris, Andrea Bellemare and, gasp, local news! Your intrepid MHBPNA Communications Director was compelled to make the short trip down town to sample free coffee from A Matter of Taste, pick up a couple of CBC buttons and spend a few moments chatting with the host of this new service. I arrived just after the show finished and caught the affable and articulate Mr. Norris as he was coming outside to mingle with the dozen or more people out on the street. I welcomed him and the show to our area on behalf of the MHBPNA. I congratulated him on how the inaugural morning show had gone quite well. Craig said they had a few “rough spots” early on, but that they had been “doing dry runs for the past two weeks” and had most of the bugs worked out. He felt pretty good about the first show. I also said that I was a little surprised about the new station and wondered if there was enough going on to warrant KW getting its own show. Craig said “You know, that is the same thing we heard from many of our focus groups that, ‘gee not much goes on around here’ but with Kitchener, Waterloo, Cambridge, Guelph and Stratford, there are lots of stories”. I also said I was impressed with the whole CBC operation they have on King Street and that when I first heard about it I thought it might be some kind of internet show. Craig said that was a common misconception that they were a “web only” operation, but was not at all the case. The KW CBC has news reporters, staff and a real web presence at www.cbc.ca/kw. I guess their “gimmick” is that Craig does the “live” show and Andrea establishes a parallel web presence, engages in Facebook and tweeting, and lets us know how our local stories are “trending”. 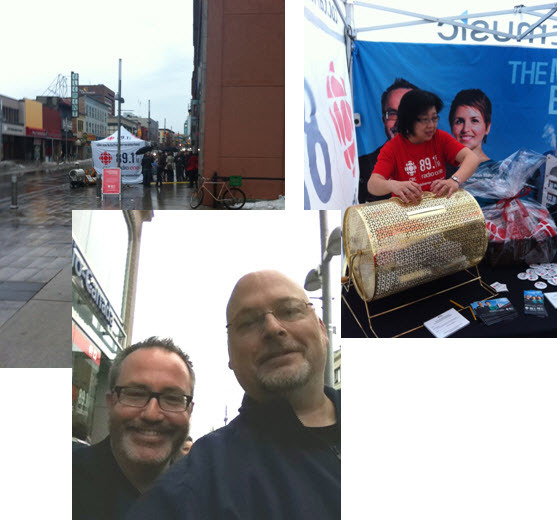 CBC had a tent out front on King Street giving away buttons, chocolate and a chance to win something in a draw. They will also be at the Kitchener Market this Saturday morning. Hey CBC, welcome to Kitchener and thanks for thinking about us!